Salthaven Wildlife Rehabilitation & Education Centres is a non-profit organisation that feed, house and rehabilitate sick, injured and orphaned wildlife in Canada. Brian Salt penned this plea for help, no doubt moved by the miserable plight of one of his patients. There are eighteen indigenous species of bats in Canada. The hoary bat (Lasiurus cinereus) is the largest bat species in the nation and one of three Ontario species of bats (including the eastern red and silver-haired bats) that migrate south to the United States each fall. It is named for the “hoary” or “frosted” appearance of its coat of grey fur with white-tipped hairs. 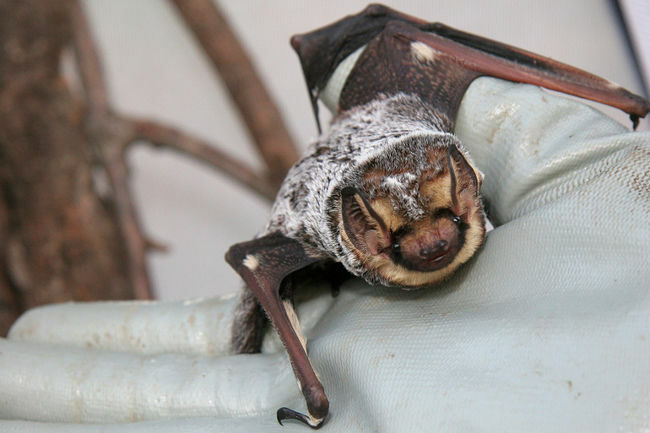 A tree-roosting bat, the hoary bat forages for large insects such as wasps, dragonflies, beetles, and moths in many types of forest in almost every province except Newfoundland and Prince Edward Island. Bats in Canada have been hit hard by many adversaries. In 2010, white-nose syndrome was confirmed in Canadian bat colonies, a disease that has drastically reduced bat populations across North America. And in recent years, yet another predator is contributing to the devastation of bat populations. 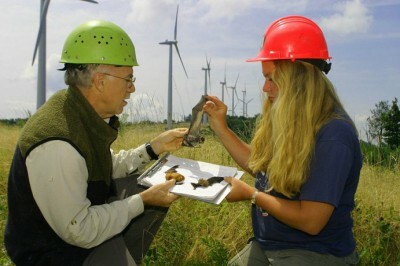 Wind turbines are now taking a toll not only on birds, but bats as well. You may ask yourself, “don’t bats use echolocation to avoid objects like turbine blades?” The answer is yes, they do. In fact, very few bats admitted to Salthaven after an altercation with a wind turbine have actually been hit by the blades. In this case, the villain is literally invisible to both their eyes and sonar, making it extremely difficult for them to avoid. The stealthy culprit wreaking havoc on these unsuspecting creatures is the air pressure differential at the front and back of the turbine blades. The sudden change in air pressure ruptures their little lungs and eardrums. Ultimately, the bats die or are so severely incapacitated that they have to be humanely euthanized. Harnessing power from the wind is one of the cleanest and most sustainable ways to generate electricity because it produces no chemically toxic pollution or global-warming emissions. Wind is also abundant, inexhaustible, and affordable, which makes it a viable and large-scale alternative to fossil fuels. However, the impact of wind turbines on wildlife, most notably on birds and bats, has been widely documented and studied and it is apparent that we need to extend our thinking beyond the clean energy aspect of wind turbines. A hoary bat that came to Salthaven this week escaped the Grim Reaper’s scythe after an altercation with a turbine, but it still sustained injuries shown by the bleeding from its ears, uncontrolled head turning (torticollis), and bulging left eye. Bats with irreparable lung damage often bleed from the mouth and die before they can be admitted to Salthaven. Fortunately, this hoary bat’s lungs appeared to be unaffected but her body language suggested she was in pain. She wouldn’t eat and had an insatiable thirst. Generally, hoary bats have a huge appetite so getting calories into her is important. She is being fed a high calorie mash to stimulate her appetite and maintain her weight. At the time of writing this article, she is holding her own, but just barely. Although the swelling in her eye has decreased, she still needs assistance when eating. 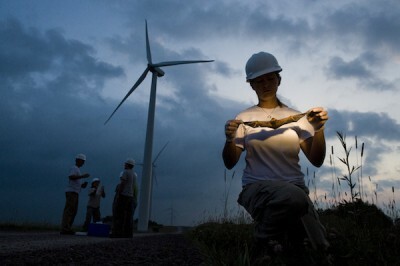 With bat populations on the decline it would be wise to consider ways to reduce bat mortality around wind turbines. For example, bats are most active when wind speeds are low. Keeping wind turbines motionless during times of low wind speeds could reduce bat deaths significantly without greatly affecting power production. Other wildlife impacts can be mitigated through erecting wind turbines in better locations. Many wind turbines currently occupy avian and bat migration routes, which increases mortality rates in these areas. In order to live harmoniously with nature, we need to understand nature itself. Only then will we be truly creating environmentally friendly solutions to our energy problems. Oh god where is the humanity is there no one listening to what’s happening to these tiny furry creatures. In other States in decades past the PC left have been prepared to see millions of Australians die of thirst to save a few reptilian frogs. But furry little mammals are cast aside as wind mill fodder. Why are the pressure GPS and charities and Governments not protesting? Wind geeks change the subject to house-cats whenever bird deaths are brought up, but they have little to say about bats. The best they can do is cite impractical schemes to put turbines in “appropriate” locations, as if there are endless options on this finite rock. It’s literally like trying to hide skyscrapers. Nothing yet from PETA? Huh. Please do not print embedded lies, no matter how great the piece. The author of the article, Brian, ‘Batman’ Salt is yet another who drank the Kool-Aid. His statement is obvious nonsense (we left it alone to see if our followers would bite, they did). The sad thing is that environmentalists like the Batman need to proclaim their love for wind power, even as it kills the environment they serve to protect. Some might call it group think, we think it cult like behaviour. STT had a choice, we could have deleted the statement and been criticised by the author, or we could have spent 1,000 words making your point. This site is for adults, so we didn’t feel the need to do either. Our followers were quick off the mark, you among them. Best of all, end wind turbines installation and, if possible, dismantle and destroy the present ones. They are a total scam, which have fooled those in charge of nations worldwide. “Harnessing power from the wind is one of the cleanest and most sustainable ways to generate electricity because it produces no chemically toxic pollution or global-warming emissions. Wind is also abundant, inexhaustible, and affordable, which makes it a viable and large-scale alternative to fossil fuels”. No. Not really. The author of the article, Brian, ‘Batman’ Salt is yet another who drank the Kool-Aid. His statement is obvious nonsense (we left it alone to see if our followers would bite, they did). The sad thing is that environmentalists like the Batman need to proclaim their love for wind power, even as it kills the environment they serve to protect. Some might call it group think, we think it cult like behaviour.